It was in 1947 that Miss Lovell (a Chartered Secretary) arrived in Brixham, leaving bomb shattered Exeter to take over a hotel on the cliff tops called The Dragon's Tail. She had been a member of the Exeter Soroptimist Club for many years. 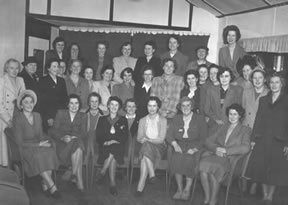 During her first year in Brixham she met many ladies whom she considered had the talents and the goodwill necessary to form a Soroptimist Club. So it started. The ladies had many meetings at The Dragon's Tail and finally committees were formed, Miss Lovell standing as the first president. 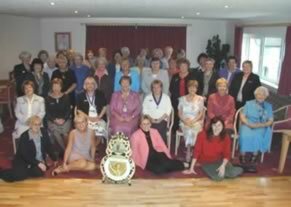 The Torquay Club gave a lot of help and advice and are still known as our "mother" club. And so it was that in 1948 we were established. The president's insignia is unique to Brixham; in addition to the Soroptimist 'Lady' we have a design of Prince William of Orange with Brixham harbour and ships in the background. This is to commemorate the landing of Prince William, at the head of a strong army, in Brixham during November 1688; William, a Calvinist, subsequently replaced James the second, a Catholic, as King. By November the Charter Lunch was arranged and held at the Lupton House, Churston. The national president came for this occasion. The founder members represented a varied list of categories: Baker & Confectioner, Beauty Specialist, Cafe Proprietress, Ironmonger, Primary School Head, Science Teacher, Stationer, Taxi Proprietor, Chartered Secretary to name a few. Throughout the years, the club's membership has been constant at approximately 40. We currently have 51 members with just as many varied categories. However these now also include: Trawler Owner & Skipper, Artist, Theatre Nursing Sister and many more.